The key to this matchup [White aggro vs. Monoblue] is to try to race them instead of trying to answer their guy with Curious Obsession. This forces them to keep mana up for cards like Dive Down and Spell Pierce without advancing their board too much, but if you ignore it and instead keep playing more creatures and attacking, you are using your mana much more effectively. So basically with any deck, you just rush out of the gates and try to goldfish as fast as possible. If they have Curious Obsession, so be it. If they leave up mana to protect their creature, fine, you use all of yours and take the lead that way. If they don't leave up mana, then you kill it. This strategy looks grim for the monoblue deck because aside from 4 Opt and 4 Merfolk Trickster, they can't actually advance their board if they leave up mana unless they have a counterspell. In the meantime, the monoblue deck is beating you down with 1/1s and 2/2s, hardly a fast clock. Maybe the monoblue deck should consider raising their curve and running more flash creatures (Whisper Agent??). Queued into monoblue two more times, lost both times. They had Curious Obsession both games, but the real key creature was actually Tempest Djinn. That has always been the big stick in the monoblue deck, and there's no way pre-board for the tokens deck to beat a Tempest Djinn backed with Dive Down and such. I still think monoblue is an inconsistent deck, but sometimes when its draw lines up well it just wins. My experience against mono-blue is basically they have curious obsession and win or they don't and they lose. Last times I played against the deck, I was playing a mono-white 18 land deck and counterspells aren't very efficient against 1-drops so they just got overwhelmed, even with multiple djinns. If you can put enough threats on the board so that they are forced to play actively instead of reactively, they're in a tight spot. They play Curious, I play Bonds. Most of the time meeting this deck I am playing my mono white. Definitely cannot recommend this deck for anything other than grinding free play (and for f2p players I guess). It's just way too fragile. When it works it looks great, but if you're on the draw and opponent plays T2 Runaway Steam-Kin, it's just game over. Half the deck also needs the other half to function, making it very inconsistent, e.g. 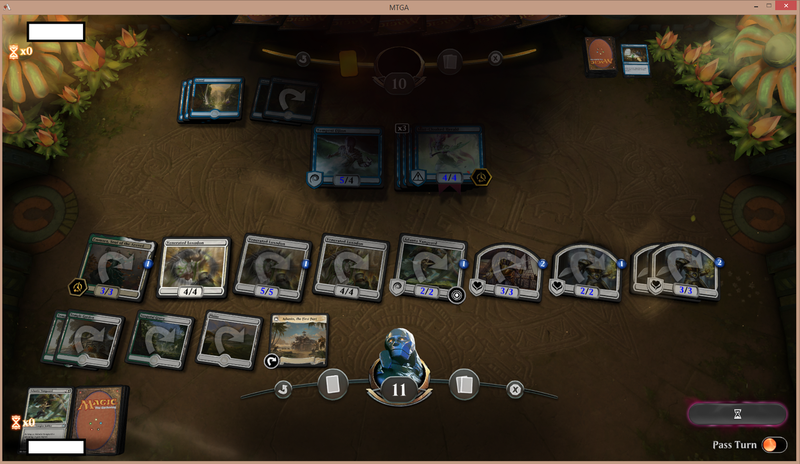 if you open a land with 3 lands, Siren Stormtamer and 3 permission spells, that hand is barely keepable. Or maybe you have a hand with 3 lands, Exclusion Mage, Tempest Djinn, and 2 Dive Down, and again the hand is barely keepable. You'll have hands where you drew Essence Scatter and opponent played Cast Down, or hands where you drew Dive Down and opponent played Ritual of Soot, or hands where you have all creatures without protection/Curious Obsession, or even worse where you have all protection without creatures. Overall it's just too fragile. I took it for a few runs in quick constructed and went something like 2-3, 2-3, 3-3. Some of the games were undoubtedly winnable (the deck is hard), and I also got cards like Ritual of Soot played against me (which is not usually a card in B/G maindeck), but many of the losses were not salvagable. Monored in particular is a really bad matchup. That said, it's good for grinding quickplay since the algorithm still matches you up against people on even worse decks. It doesn't happen all the time (queued into B/G a couple of times), but it happens often enough that this is still a good first deck to craft. It's possible that White Weenie is even better, but that deck needs several mythics and rares, while this only needs four rares. Monoblue with "nut draw" against Selesnya tokens board state at end of game. Turn 1 Herald into three (!) Curious Obsession not strong enough, RIP Monoblue. It seems monoblue improved quite a bit with the new set. Two reasons for this: meta changes (slow midrange decks with expensive removal are good matchups), and Pteramander (which provides a reasonable late-game mana sink while still being an evasive attacker when played turn 1). There's only one big problem: the matchup against monored remains terrible. Yeah, you could make a serious case for Mono U being the best Bo3 deck right now. Pteromander was so big for the deck, exactly what it needed - cheap creature for the obsession, and while we're not Adapting this turn 3 or anything if your opponent taps out in the late game you can often just adapt and kill from like 10+ life with a Tempest Djinn, much, much better then Mistcaller ever was. Tough deck to pilot though, sure you get those games where you t2 obsession and ride it to victory, but squeezing out the wins when you don't get the nut draw, especially against RDW is often like walking along a tightrope - whenever i lose i always feel like i could've scrapped the win by doing a couple things differently. Well, mono blue won the scg this weekend, guess it's official now. Guy said he'd borrowed the deck from a friend and only played a couple games before the tournament. Pretty crazy, I find the deck hard to navigate, just knowing what to mulligan seems game deciding. Indeed, especially since the sideboard was apparently great. That's surprising since I always thought monoblue gets worse after sideboard. However, it's understandable: if opponent is a creature deck you can board increase your Essence Capture and Exclusion Mage count, if they have spells you can bring in Negate and Spell Pierce, and so on. Even monored can be boarded against with Surge Mare. I might just commit to the deck for this season (although truth be told, the deck's so cheap I already have most/all of it). I also begin to feel the deck's difficulty is overstated. Yes, deciding when to hold up mana is not easy, but these days I feel like the decision is often clear. Although I can lose if I make the wrong choice, I'd still have made that choice in hindsight, and often just end up chalking things up to "if my opponent has it I lose". idk. I played a decent amount of Bo3 games with it recently, and I have to admit the current deck is pretty good, but it does not stand above the meta as best. It usually folds to WWx and also has issues with drakes. It has good chances vs. Sultai (and even vs RDW), and it eats Esper, other control and gates for breakfast. So it's very meta dependent. As we saw last weekend, a decent player can pick it up and pilot it to win a large event. You need some luck of course but that's always the case with magic. I do think however that you need to play quite some games with it to understand all the tricks and optimum plays you can do, because there's quite a lot of choices to be made (not a very linear deck). Thought I would share my BO1 version that is a little unorthodox but so far has been great. 4x Surge Mare - RDW's and Golgari's nightmare. He is mana intensive to work with at times but i have found he is the thopter copter this deck needs that does more than opt or chart a course could ever do vs aggro. 2x Exclusion Mage- Great card to out tempo aggro and a body vs control. Only 2 here but has been good when I need him. 4x Dive Down - I play the deck vs RDW often and this card allows you to win. 4x Spell Pierce - same as above but great vs any on curve control sweeper or teferi. Good vs enchants and that early nexus as well. 4x Wizard's retort - Mostly played for UU and I don't run creature counters so pretty much my only answer to serious threats. 21x Islands - have thought about going up to 22 because I play without a lot of the filtering other MonoU plays with but thats what surgemare is good for but he also needs mana to attack. Fun deck to play and I am hoping to play it more often as I just upgraded to a new machine. Now if only teferi could help me out with slowing down time so i could actually play more. Been running 1-2 blink instead of exclusion. I figure it's 2 mana, instant speed and can bounce more than just creatures - bouncing a wilderness reclamation after they tapped out to cast it is satisfying - and if I get flooded (with 19 lands it happens with obsession going) can pay the kicker to draw a card. Not sure if that outweighs having another creature to attack with, but it's a spell worth considering I think. Now I see it in the opening hand of every mirror. Yeah I felt the same when I started playing it (and still do sometimes). What helps a lot is watch people stream it, read all the info you can get on a deck. For example https://magic.facetofacegames.com/alexander-hayne-1-mythic-with-mono-blue-aggro/ is a very good source of info, the dude (Alexander Hayne) knows the deck inside and out and wrote a whole SB guide for it. Thanks! I can't find the write up though? Ive checked that link and his twitter. Do you have a direct link? Nevermind I see it. I don't use twitter.